As part of the “Durban Strategy,” which was formulated at the 2001 UN Durban Conference and which seeks to isolate Israel, several medical NGOs accuse Israel of “human rights violations,” alleging that Israel denies Palestinians’ access to medical care, violates their right to health, and is responsible for poor health markers among the Palestinian population. These groups use their humanitarian work as an opportunity to take partisan positions against Israel, using medical jargon and their reputations as medical experts to advocate on issues far removed from medicine in order to support Palestinian political goals. The medical community, broadly defined, is morally committed to the highest standards of professionalism and universality, treating those in need irrespective of other factors. In contrast, a number of highly influential non-governmental organizations (NGOs) claiming medical mandates and active in the framework of the Arab-Israeli conflict consistently violate these moral principles. Independent of the health services provided, sometimes on an impressive scale, these groups have intentionally politicized medicine, using it as a means to demonize Israel and discriminate against Israelis. 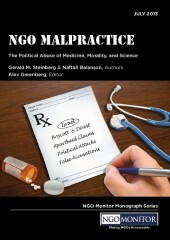 This monograph opens with an analysis of how medical NGOs are received in the media, showing how mainstream media and medical journals act as facilitators and “force-multipliers” for NGO political agendas. Despite their stated editorial guidelines, media outlets ignore the obvious politicization of these groups; the “halo effect” exempts NGOs from the scrutiny that is applied to other political actors. Outlandish NGO claims are repeated at face value, and senior NGO officials appear as “talking-heads” on reputable news channels, such as the BBC or CNN, and have their opinions reported in newspapers as objective analysis. Although officials from these medical NGOs have no legal expertise, their conclusions regarding alleged “violations of international law” are repeated and accepted without question. This process is also characteristic of a number of professional medical journals. Although they purport to maintain academic and scientific standards far above those of general media, medical journals have been abused, providing highly distorted versions of the past or current affairs in order to demonize Israel. Of note, The Lancet, it appears, has adopted a partisan political agenda, presenting it as having been vetted through a stringent evaluation process. After discussing the impact of NGOs in the media, the paper turns to the five main politicized medical NGOs active in the context of the Arab-Israeli conflict: Médecins Sans Frontières (MSF/Doctors without Borders), Medical Aid for the Palestinians (MAP), Physicians for Human Rights–Israel (PHR-I), Palestinian Medical Relief Society (PMRS), and Gaza Community Mental Health Programme (GCMHP). Although these NGOs vary in size, membership, agenda, and claims to impartiality, they all have a significant presence in the international media and policy impacts, which facilitate and amplify their roles in political warfare targeting the State of Israel. The five medical NGOs selected for detailed and systematic analysis in this study illustrate the general practice among many politicized medical organizations that make use of health related claims in opposing and condemning Israel. Médecins Sans Frontières (MSF/Doctors without Borders) is among the largest and most prestigious international NGOs. MSF’s charter rejects the politicization of aid, and this appearance of impartiality gives its accusations against Israel greater credibility. In contrast, its leaders have occasionally used public platforms, including a 2004 article in Diabetes Voice and press conferences during the 2009 Gaza conflict, to selectively accuse Israel of war crimes and other violations of human rights. Medical Aid for the Palestinians (MAP) is a major UK-based charity operating medical clinics in the PA, Gaza, and Lebanon, with senior British public figures on its board. MAP has promoted a divisive, anti-Israel narrative through its lobbying of the British Parliament. MAP has also repeatedly joined with other political advocacy NGOs to lobby the European Union and other international actors to sanction Israel and force policy changes. Physicians for Human Rights–Israel (PHR-I) is an Israel-based political advocacy group, whose openly partisan activity includes “solidarity” events in support of often violent Palestinian protesters. PHR-I has waged a decades-long campaign alleging the complicity of Israeli medical professionals in the torture of Palestinian prisoners. These well-circulated and oft-repeated claims are based on unsubstantiated claims that have not been corroborated by PHR-I. The Israel Medical Association severed ties with PHR-I due to a related campaign. Palestinian Medical Relief Society (PMRS) is led by Palestinian politician Dr. Mustafa Bargouthi. PMRS views its humanitarian endeavors “as an entry point” for political advocacy and action. Accordingly, it has attempted to link Israeli policies to specific medical conditions in Gaza, ignoring other factors that do not contribute to the demonization of Israel. PMRS has also repeatedly accused Israel, without evidence, of deploying unconventional weapons. Gaza Community Mental Health Programme (GCMHP), as its name suggests, focuses primarily on psychological issues. Its demonization of Israel also highlights this aspect, with officials repeatedly claiming that Jews are “psycho-pathologically disturbed” and that Israeli soldiers are psychologically unstable. GCMHP also promotes anti-Israel Durban Strategy campaigns, such as BDS and the Free Gaza flotillas.